On 22nd May, at 9am, the Exhibition Bus rolled into the grounds of The Swaminarayan School, London on the invitation of its senior Head Teacher, Mr Nilesh Manani and Junior School Head Mr Umesh Raja. To make the most of the exhibition in the Bus, the school organised one class at a time to experience the exhibition through the day. Each group watch the video on board after a brief introduction from the on-board educator. We had just over 300 pupils who ‘hoped-on’ the WW1 Exhibition Bus. 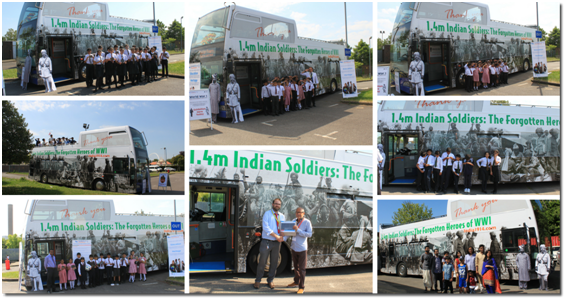 Most them watched the entire video (http://bit.ly/India1914_WW1_Bus).